Rabindranath Tagore (1861-1941) had warned not to look for the poet in his biography. The Tagores were well-off, renowned. His grandfather, Dwarkanath, who built the family fortune, was known as a ‘Prince’ and counted among friends not only Rammohan Roy but Queen Victoria. His Father, ‘Maharshi’ (Great Sage) Devendranath was at once a noble. He broke away from the conformist Hindu ways and joined the Brahmo brotherhood (Brahmo Samaj), whose leader he soon became. Rabindranath, the fourteenth child, was born on May 7, 1861, in the inherited mansion, Jorasanko, in mid Calcutta. The boy saw little of his mother whose time was taken up in looking after a mammoth, extensive family. Under his father’s order, the children led a rather Westernized life. Apart from tutors, there was a wrestling master. In due course he was sent to a school, a number of schools. The formal education did not suit him. At last, he became a dropout. Literature, music and poetry were part of the Tagore household. Also they had to learn a little more English than others. Prior to being sent to England, possibly to join the Bar or the Civil Service, he spent some time at Ahmedabad, with his civilian brother, Satyendranth. The year and a half at the London University were amusing but unproductive. He never completed the course. On the other hand, his sparkling letters, published in a journal, caused raising of eyebrows. His father called him back. Has entered the darksome cavern. How swift the light of the sun! The starting of a school for children at Shantiniketan (December 21, 1901) finds Tagore in a new role. In the world outside, the British game of divide-and-rule was at work. The Partition of Bengal (Bangabhanga) was in the offing. At Dacca, Lord Curzon had dropped a hint about a Muslim-dominated separate province. This was strongly resented. Tagore was deeply involved. In his essay on Swadeshi Samaj he analyzed the grass-root problems of an actually Indian social polity. The poem on Shivaji (August 1904) was another eloquent phrase of nationalist gusto. As the time of Bengal Partition (October 16, 1905) drew near, the approach of the people stiffened. Boycott of British goods was announced and, to a large extent, adhered to. 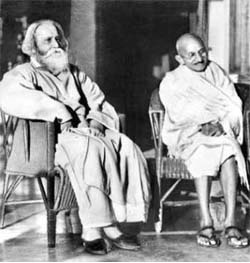 In Calcutta’s Town Hall Tagore read a paper, “The Situation and the Remedy” (Abastha O Byabastha) in which he strongly recommended the setting up of a parallel government. His songs were on everybody’s lips. He had suddenly become a people’s writer. It was during these stirring days that he wrote “Sonar Bangla” (Golden Bengal), which was to turn out to be, ironically, the national anthem of Bangladesh. He was writing Gitanjali. Though this is perhaps not his best or greatest work, it was destined to change the significance of his life. Whether it marks a break or division in his career or not, there is an increasingly international note in his public gestures. On November 19, 1912, after he had returned to India, came the news of the award of the Nobel Prize for Literature to him. The news did not arrive in total as a revelation. He is reported to have said, “I shall never have peace again.” That it gave him an international status and position is palpable. Tagore had noticed Gandhiji’s South African satyagraha. On March 6, 1915, the two met for the first time at Shantiniketan. This was the beginning of a long friendship, of course not without its ups and downs. It was Rabindranath Tagore who had given the title “Mahatma” to Gandhiji. Gandhi had started a Non-cooperation Movement. Shantiniketan was not impervious. The poet returned to India in July 1921. Political discussions, which he could not avoid, took much of his time. On the creative side he wrote Saradotav (Autumn Festival), a perennial school favorite. More significant was the dedication of the institution, now Visva-Bharati, as a public trust (December 21, 1921). In May 1925, Mahatma Gandhi came to Shantiniketan. The two held discussions on several national issues, including charkha, the conjecture and live out of the spinning wheel. Strangely, it was Rabindranath who appeared to be more of a rationalist than the Mahatma, for whom charkha had become something of an inclination. The idea of extending the school had been in his mind for some time. Speaking as the Chancellor of the National University at Adyar he put forward his thesis on a Centre of Indian Culture, such as he wanted Shantiniketan to be. Tagore visited England again in 1920. It was an ill-timed visit. Because of his refusal of the Knighthood, the British were cold towards him. Also his proposal that they should at least admit their mistake at Jalianwala Bagh did not recover matters. Reasons of health had forced him to adjourn the Hibbert Lectures at Oxford. The lecturers were delivered in 1930. He chose for theme “The Religion of Man”. In April 1940 Gandhiji came to Shantiniketan. 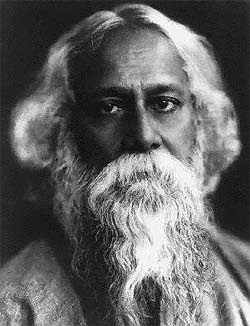 Tagore handed over to him an epigrammatic letter pleading for the preservation of Visva-Bharati, “the cargo carrying his life’s best treasure”. On August 7 the Oxford University confirmed D. Litt. (honoris causa) on him, at Shantiniketan itself. His last birthday address, “Crisis of Civilization”, had to be read out, with the tired poet reclining on a wheel-chair. Though buffeted he kept his faith till the end. “I shall not commit the grievous sin of losing faith in Man.” Finally, he had to undergo surgery and was removed to Calcutta. Too weak to write, he dictated two ‘terrible’ poems: “Sorrow’s Dark Night” and “Thou Guileful One”. These give a new focus on his life and works. On August 7, he passed away. Gurudev Rabindranath Tagore was a man of vision and outlook. In one of his lectures he has written, “I love India not because I cultivate the idolatry of geography, not because I have had the chance to be born in her soil, but because she has saved through the tumultuous ages the living words that have issued from the illuminated consciousness of her great sons.” (A Vision of India’s History). His life was more of a challenge full of tensions, surprises and creativity, is a paradigm to emulate for all generations to come.